EUR/USD kicks off the new year with fresh gains, taking advantage of the US Dollar’s weakness. What’s next? The next resistance line is quite close. The Technical Confluences Indicator shows that the world’s most popular currency pair is capped at around 1.1504 which is the convergence of the previous 1h-high, the Pivot Point one-week Resistance 1, and the Fibonacci 61.8% one-day. If it overcomes this cap, the next level to watch is 1.1558 where we see the meeting point of the Fibonacci 23.6% one-day, the PP 1w-R2, and the PP 1d-R1. Some support awaits at 1.1486 which is where the BB 1h-Middle, the BB 1d-Upper, and the Simple Moving Average 5-4h converge. Further down, a cluster of support lines awaits at 1.1438 which is the confluence of the SMA 5-1d and the Fibonacci 23.6% one-month. 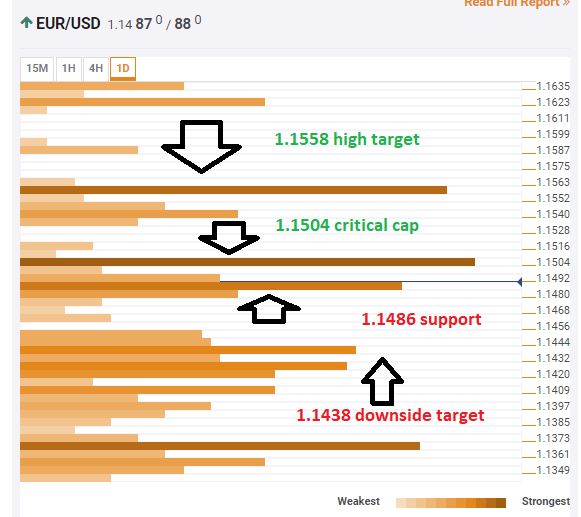 All in all, the pair needs to break above 1.1504 to unleash the upside, but that is no easy task.